I've been crazy obsessed about yellow purses and bags lately. Since I found this little gem at H&M, I've not left home without it! It's a pastel shade of neon yellow, which is PERFECT for me. It goes with almost everything. Using a pop of colour in your outfit is a great way to add freshness to a look. I know that sometimes using colour can be quite intimidating, trust me I know (I went through a phase when I only wore black and nothing else). 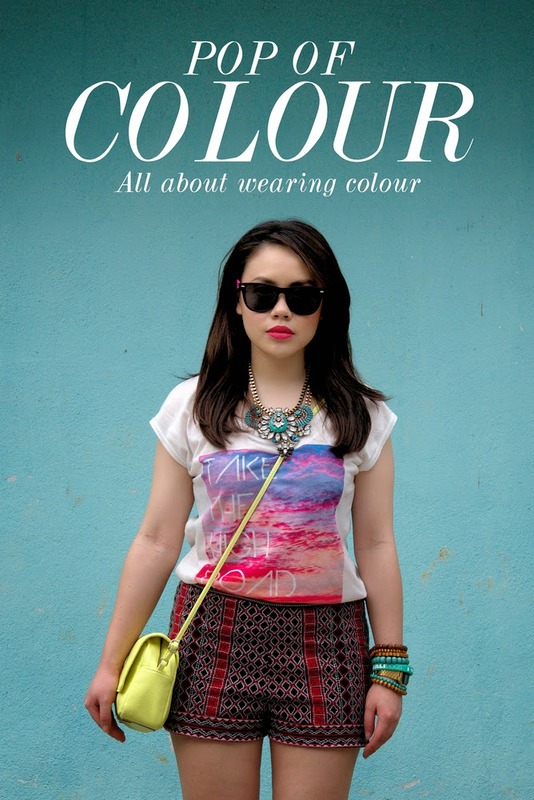 If you're used to wearing darker colours, switching to colourful outfits may seem overwhelming. Don't worry, there are easy ways to convert to colour. One method is to match a neutral outfit to one bold coloured item in your outfit. The key is to tone down all other pieces in your outfit. For example, if you're carrying something really bright coloured, - hat, jewelry, bag, shorts, an easy way to compliment the coloured accessory is to pair it with a monochrome outfit. Because monochrome, goes with everything. EVERYTHING. If you don't like monochromes, an easy method is to stick to one colour theme. For example, gray dress and an orange belt or bag, or blue top and pants with pink accessories. If all else fails, colour and black always works too. These are really good examples of how colour is used in outfits. Ahh.. so refreshed and so inspired! First image by Moose Pixels. All other images from here, here, here, here, here, here, here, here, here, here, here and here.